Following on the heels of shows at the Blue Moon and the High Dive, we’re putting on our next and first show at the Comet this Friday, August 20th! I am really, really happy about this and we’re fortunate to have such an amazing lineup: Wayfinders, Hotels, Katie Kate and Steel Tigers of Death. Although STOD are not on the poster, they are absolutely on the bill and I encourage you to get there early to catch them. Wayfinders is a gorgeous project including Lars Swenson, Jan Norberg (whose project Bats of Belfry was one of my favorite things ever), Justin Deary of Whalebones, and Mason Lowe (former percussionist of Brent Amaker and the Rodeo). 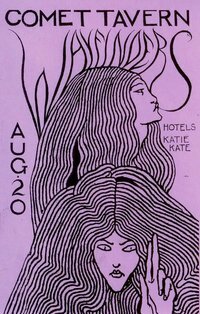 Hotels is such spectacular music, and Katie Kate blew my mind when I saw her perform at Neumos’ Ladies’ Night. Her song “Hunting” is pure bliss. Written by: Dagmar on 08/14/2010. This entry was tagged comet, hotels, katie kate, posted by dagmar, steel tigers of death, the comet, wayfinders. Bookmark the permalink.